Scott Harmon is the Co-Founder and CEO of Swivel, an Austin-based Next Coast portfolio company that is changing the real estate game for startups by focusing on one of our investment themes: the changing future of work. You’ve had a lot of experience scaling tech and software companies, what made you want to shift your focus to the future of the work for your latest venture? Swivel is the result of 25 years of frustration with how we provide workspace for our people and how we empower them to do their best work. I’ve been part of six different companies from startup through IPO, so my first thought was that I had just wrestled with these exact issues myself, whether it was with a five-person company or a thousand-person company. Right now, the way we approach ‘work’ is nearly 100 years old, a by-product of the industrial revolution. It’s just crazy. We’ve revolutionized digital tech like Slack and video conferencing, but the physical aspects of how teams organize their space hasn’t changed a bit. Just like AWS allows you to flex the amount of storage you need up or down, you should be able to flex your workspace up or down as well. It’s a really transformative idea and there’s an enormous amount of value to unlock. Why is flexible working so crucial to growing companies? From a financial perspective, renting office space for 5 or 10 years at a time is a huge structural problem for companies. Companies typically get offered a five or ten-year lease if they want to control their own workspace. How many companies honestly know how many employees they will have ten years from now? Why would you want to pay for all that space ten years in advance? It’s outrageous and it’s a big structural problem for companies. If you’ve turned the corner and you have a real company, you’ve raised capital from some prominent VC firms and you’re off to the races, you don’t want to work in a fishbowl. If an entrepreneur is trying to escape the fishbowl and their only other option is a ten-year lease, they’re stuck. Those are your only two options and they’re both bad. Flexible working allows entrepreneurs to be leaner in their budget and more flexible with their time. How does Swivel compare to other workplace-focused companies like WeWork? Swivel is part of the second generation of ‘flexible working’ where coworking, like at WeWork, is part of the first wave that began about ten years ago as a result of the recession. Coworking targeted the needs of freelancers or people that were self-employed, which was really important especially after the financial crisis of 2007. But freelancers are only about 3 percent of the U.S. workforce - the other 97 percent work for more traditional enterprises. Swivel and this second wave of flexible working is about those small and mid-size businesses and introducing those workplace alternatives to the mainstream economy. The second generation is all about combining the flexibility and ‘ready-to-work’ aspects of the first generation of coworking, with the ability to have your own private office in a location of your choosing, but without the burden of a traditional lease. Swivel has evolved a lot over the past year, as a founder, how do you stay true to your original thesis while still adjusting your product to the market’s needs? That is the one of the real tricks of the first couple years of a business: how do you hold on to the founding principles and the reason you started the business, but not be tone deaf to what the market needs? There are well-documented processes for how you dial in product-market fit, and just by probability, your original product assumptions are almost always wrong in some important ways. Most books and experts say that it can take 6 to 18 months - or even longer. So you have to be prepared and embrace the fact that in the early stages, your first job is dialing in product-market fit. That’s really what seed financing is good for, so keep your burn down until you have product-market fit dialed in. You’re iterating, so you just have to be facile and flexible on the way to what your value proposition looks like when it’s reflecting what people want. The lucky people are right with their original guesses, but we weren’t. We were probably off by 20 degrees, and we changed quite a bit about our core product offering and go-to-market strategy to fit what people that run small businesses really wanted. You have to just hold those things with a loose grip, not a white-knuckle grip, and just let the world tell you what it wants. Prideful entrepreneurs don’t tend to do that well unless they’re insanely lucky. How should founders balance the need to create company culture without spending too much bandwidth on hunting for office space? 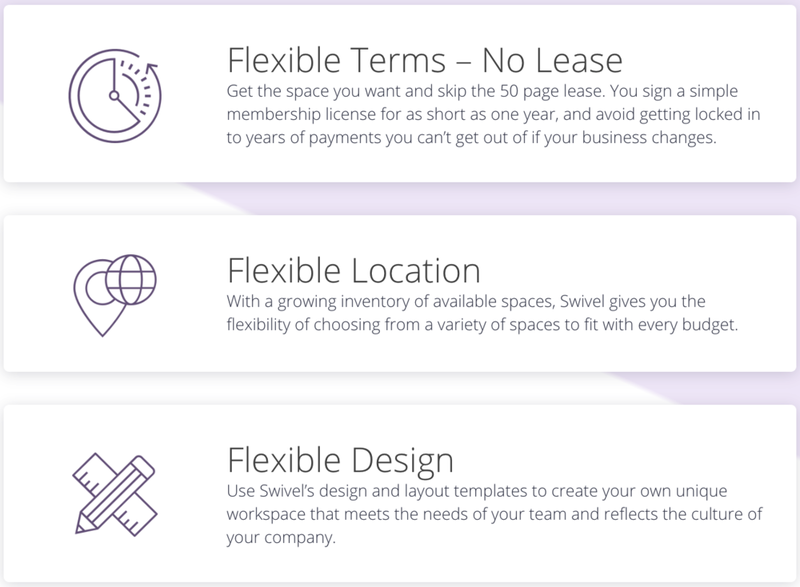 Sample of Swivel office space from their property directory. WeWork has a $35 billion valuation because the founders believe it provides more than just physical workspace, how much do the ‘extras’ play a role in the flexible working world? It’s a war for people and people are impressed by that stuff, especially in tech which can go over the top with amenities. Ordinarily the people who win those wars are Google or Facebook who have the budget to create a physical space that is almost Taj Mahal-esque. When you bring developers in there they just swoon. Little companies have to compete with that, and the answer is not to spend a billion dollars, but you do have to be thoughtful about it and make some statement with your office space that this is a cool place to work. WeWork likes to argue that they do have extras that merit their unicorn-like valuation; things like ‘spirit’ or ‘community.’ While these can be valuable, I think it’s mostly relevant to freelancers or self-employed individuals. We are targeting small and mid-size businesses that need both a flexible business terms and the ability to curate their own workplace design. These companies tend to be lean and growing like crazy, so they are looking for another tool to streamline their hustle and be more competitive for talent, that’s when Swivel comes in. You’ve scaled several successful businesses in Austin, what is your perspective on looking for local vs. Silicon Valley investment dollars? I’ve learned it’s important to mix Austin money with Silicon Valley money in every round because I think you get some things from SV money and some things from Austin money - some are good and some are bad, so blending them is best. The amount of gasoline - capital - they can throw on the ‘fire’ of a good idea with market traction is just beyond belief. But in Silicon Valley, you can only hold on to key employees for 18 or 24 months max and that’s it because 15 competitors will be booted up within 9 months of a great idea because you can spin up companies so fast these days. So SV investment partners give you the confidence and the resources to be bold and grow rapidly when the time is right. But in Austin, there aren’t as many competitors that can steal your people and there won’t be 15 competitors popping up around the corner as soon as your idea is made public. Capital can be more patient, focused and determined here, which makes it easier to keep your burn rate low and be able to thoughtfully dial in product-market fit, which makes for a very strong foundation. And while I think you should have capital from both places, I would never put a company in SV. It’s too unhealthy there, it’s a crazy cauldron and it’s just too expensive. What does the future of work look like over the next few decades? We think we’re early on in the life cycle of getting companies to embrace this phenomenon. I think what we have now is two extremes, and the way I see the future unfolding is a rush more towards the middle trend. Right now, there are a lot of companies where people work remotely all the time and employees have never met each other face to face. There’s also a lot of traditional companies that rule with an iron fist and want their employees in one central office, at a desk, five days a week. The middle means being physically together and remote in ways that match what the company and its constituent teams are doing - and what problems they are trying to solve - at any particular time. In essence, technology will make it possible for workspace to flex and adapt to the changing needs of the business, rather than the other way around. Scott started his career by applying his comp science degree from Iowa State in the computer industry, working for Hewlett Packard. In the early 90s, Scott caught the software startup bug, first with Tivoli Systems (IBM) as vp of marketing and strategy, and then as cofounder and CEO of Motive Communications, which went pubic in 2004. He then led two other tech startups, Alterpoint and Noesis Finance, both to private exits. In 2016, Scott launched Swivel with the purpose of making office space radically simple for growing businesses, bringing his startup count to five companies over a 25 year span. Clearly, Scott has a thing for startups.